This black bean burger recipe has been a favorite of mine for many years. I'm not a big fan of most veggie burgers but this one is so good you don't miss the meat at all. It has such a wonderful flavor & texture plus it is super easy to make. This time around I did use the Bacon Chipotle Sauce in the burgers so they aren't completely vegetarian but you can easily replace that with any salsa. 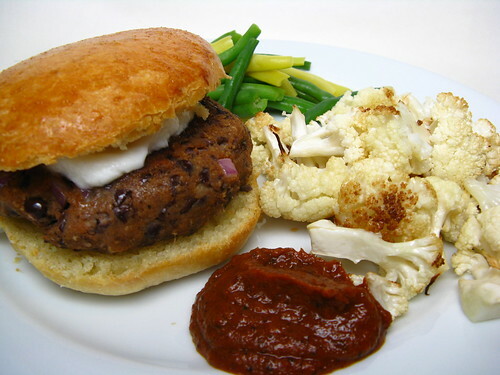 I like these burgers topped with a little sour cream or plain yogurt. Matt mixed some hot sauce & mayo together for the top of his. Cheese would be great too. For a side dish we roasted a some cauliflower tossed in olive oil & salt at 400 F for about 30 minutes then served it with the Bacon Chipotle Sauce. Smash the black beans with a fork or potato masher. Stir in the remaining ingredients. Form into 2 or 3 patties. Cook on a well oiled grill or griddle 3 minutes per side. The burgers should be warm through. Yum! I will be trying these. I love veggie burgers but only the ones that are not the fake meat kind. Terrific, healthy idea! I once did a Portobello mushroom burger where the mushrooms were chopped up really tiny & mashed into patties w/ breadcrumbs, etc. My kiddo noticed that something was different about the burger, but he ate it anyways! I never thought I would EVER say this, but I want the roasted cauliflower! Beans are the perfect substitution for meat in burgers. They are the perfect vegetable, right? Love them! They look so perfect, and I love that your side was roasted cauliflower. What a great plate full of food! it's so simple! i love that you don't require eggs and all that. it looks perfectly dense and hearty and delicious. I actually do love a good veggie burger, not that crap they sell in the grocery stores. This one looks meaty and seems to have a good amount of flavor too. I've been looking for a great veggie burger. I can't wait to try this one. Sounds great! I've been looking for a good veggie burger recipe. I found one with black beans recently, bought all the ingredients and never made them! Now I might try this one instead! I made these burgers last night, but mine came out kind of mushy. Have you ever had that problem? Maybe I just didn't cook them long enough? i seriously adore black bean burgers, and i really appreciate the simplicity of this recipe!! a definite must-try. thank you! It's great seeing less meat-centric recipes!